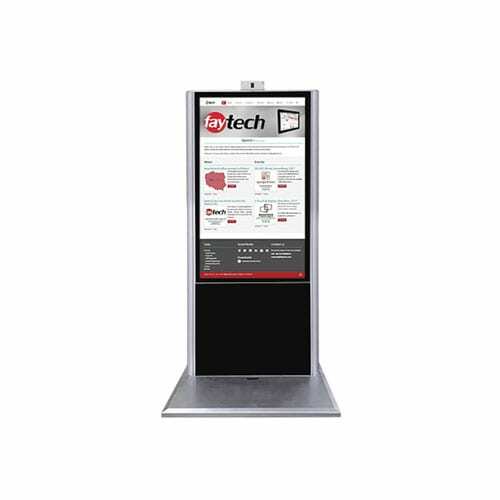 faytech North Americas touch PC kiosks are available in the following sizes: 21.5″, 32″, 42″ and 55″. The PC Kiosk series feature industrial grade, full HD LCD panels designed for 24/7 continual use. All of our kiosk models include capacitive 10-finger multitouch display interfaces, and have an aesthetic, slim and stylish appearance. 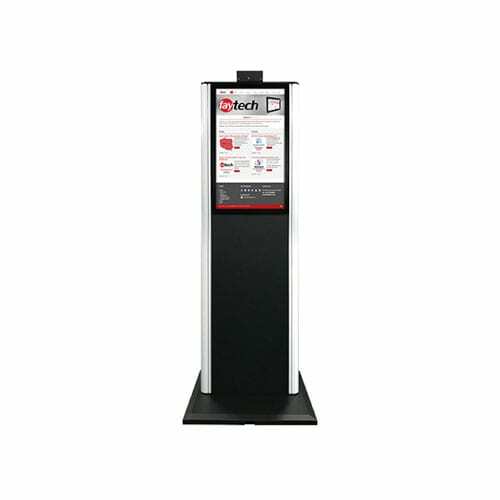 These are the perfect kiosk solution for a variety of commercial uses and industrial applications. 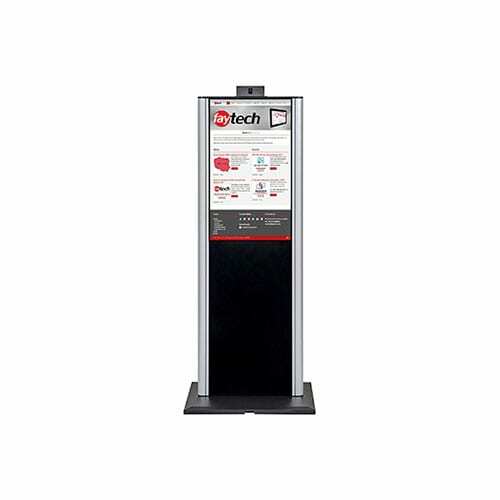 Why choose a faytech North America touch screen kiosk? While it started out as a clever idea to make future digital devices more interactive, touch screen technology is now being adopted in many ways. Over the years, this technology has continued to evolve at a blistering pace. It has become pervasive in modern electrical gadgets such as smartphones, tablets and gaming consoles. Recent advancements in technology have now made the use of touch screen kiosks to gain tremendous popularity in the business world, and as a leading touch screen kiosk manufacturer, faytech NA can clearly see that kiosks are going to grow in popularity over the years across countless industries. Interactive touch kiosks serve several roles depending on their intended use. Some kiosks simply provide access to information that customers would want. For example, an electronics store can have touch screen terminals at the lobby, allowing interested buyers to view features and details of various appliances that are on sale. It is also common to find large shopping malls, airports, and hospitals that have interactive kiosks designed to provide directions for visitors. Other units run applications used to facilitate commerce, entertainment or communication. You can find such self-service kiosks at drive-through food outlets, music stores or departments at government buildings where information seekers can request information or services. Why use a PC kiosk in your industry? Due to the wide range of applications that interactive kiosks serve, they have been widely embraced in the financial, hospitality, food service, and retail industries. Why would any business use these terminals in the first place? Well, the immersive nature of interactive screens offers a powerful way to engage with customers. As such, the ease of using a touch screen to make a purchase or look up information instead of waiting in line helps customers to have a convenient shopping experience. Businesses, regardless of type or size, can benefit from digital touch kiosks available to their customers – or even internally for routine employee functions. How do the kiosk PC systems work from a technical perspective? A typical PC touch screen kiosk runs directly from a wall power outlet that can provide 120-240V. The tablet housed inside a kiosk stand uses an operating system like Linux, Windows or Android. However, you will most likely need to work with software developers to design a touch screen interface for the end users. In most cases, touch screen kiosk applications are developed to serve the needs of a specific business or organization. Depending on the complexity or functions that one desires to carry out with the self-service kiosk, some systems work with added hardware such as cameras, scanners, printers, card-swiping machines and more. Once the kiosk software application is installed in the device, it allows users to interact with the information or services they are seeking without having to ask for assistance from anyone. The use of touch PC kiosks is just gaining momentum in the business world, but this technology has been around for a while. The invention of the very first interactive kiosk dates back to 1977, which was the handiwork of a pre-med student at the University of Illinois. That machine ran on a plasma display panel and allowed students as well as teaching staff to look up information on extra circular activities, courses, maps and directories. faytech NA’s interactive PC kiosk solutions have improved kiosk functionality in leaps and bounds as far as performance is concerned. Thanks to technology advancements in touch PC computing power, modern touch screen kiosks have faster processors, larger memory, and touch screens that are more intuitive compared to those found on earlier systems. This has enabled businesses to find numerous uses for touch screen terminals. When deployed well, touch interactive kiosks can benefit businesses in many ways. To begin with, you can use self-service kiosks to cut back on human capital. For instance, one of these machines may conduct sales instead of hiring a cashier. Customers can then make payments at the terminal and collect their merchandise at the checkout counter. The touch screen terminal will continue to serve clients without the human expense involved. Does contracting a US-based kiosk manufacturer make sense for your industry? If you are not looking to cut back on operating costs, an interactive kiosk can help reduce customer wait time. This would work best when using the touch screen terminal alongside other staff. Take a retail store as an example, cashiers can serve customers who are in line while other buyers with fewer products to purchase or those who are more technologically-savvy can use a touch screen kiosk to complete transactions at the same time. Another benefit of implementing the use of interactive kiosks is that they make it easy to disseminate information. Kiosks that operate on a network allow for fast updates. This means that a store owner could easily access the product database to make instant changes on discounts, prices or stock availability. This eliminates expenses incurred while using traditional paper-based methods such as printing of catalogs and price tags. It is also possible to conduct sales even outside normal business operating hours with the help of a touch screen kiosk. All you have to do is place one of these machines outside your business premises. The kiosk will continue to serve customers, expect it won’t take sick leaves, vacations or require the same overtime remuneration an employee would. Depending on what your business offers, you can provide information or even let customers buy items and pick them at their own free time. As a result, your business can offer customers a convenient shopping experience, without adding on other expensive overhead costs. From driving up sales and cutting back on human capital, to delivering information and providing customers with a convenient shopping experience, touch screen kiosks provide real value to business owners. The beauty about these terminals is that you can easily customize them to suit your business operations. For this to become possible, make sure to enlist the services of a professional company that designs bespoke touch screen applications for businesses. Contact us today to speak with our PC kiosk specialists. faytech North America can help you to identify the best solutions for your specific needs and market requirements.